Driven by its commitment to continuously playing an active role in supporting green and social responsibility initiatives locally and globally, Doha Bank, the largest private commercial banks in Qatar, has announced its sponsorship of the sixth edition of Qatar International Agricultural Exhibition. The exhibition held under the patronage of HH Sheikh Tamim Bin Hamad Al Thani, the Emir of the State of Qatar, at Doha Exhibition and Convention Centre (DECC), from March 20 – 22, 2018, was attended by HE Mr. Jassim Saif Ahmed Al Sulaiti, Minister of Transport, Mr. Braik AL-Marri Acting Chief Retail Banking Officer at Doha Bank and Mr. Ahmed Al Henzab, Head of Administration & Property Department at Doha Bank. Doha Bank’s sponsorship of this year’s Qatar International Agricultural Exhibition, also known as AgritechQ 2018, comes as part of its initiatives to support and promote sustainable development and environmental awareness. 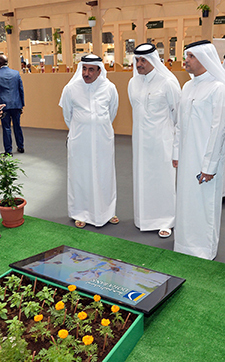 The bank’s several sustainability-focused initiatives include the ECO-Schools Program in partnership with UNESCO, annual Al Dana Green Run, eco-friendly banking products and services such as Green Mortgage, knowledge-sharing roadshows and an array of Corporate Social Responsibility (CSR) endeavors. “As an organization that proactively participates in nation-building, we believe it is our responsibility to support initiatives that will promote research and development in the farming sector. We look forward to working closely with the government and environmental and agriculture specialists to learn more about the industry to enable us to capitalize on business opportunities and future developments in this sector” he added. Qatar International Agricultural exhibition will highlight innovation in agriculture and identify the imperatives to achieve food security and sustainable development. It will also provide an ideal platform for local and international agriculture stakeholders to exchange expertise, discover trends and developments, and seize business opportunities. Similarly, the event will offer visitors the opportunity to explore a wide range of agricultural technologies, equipment, and related products, meet key decision-makers, and discover the best practices in the sector.